Evil plots his return to power and Good fights to defeat Evil's sinister plan. Caught between them in this epic struggle are two young lovers, Martak, master of the forest, and Marianna, a beautiful maiden and governess to Rosy, the impetuous, young princess. Evil's desperate scheme to outwit Good and rule the Kingdom puts Martak, Marianna and the Princess at risk as they are drawn into the conflict. Will the soulmates realize their happily ever after? Martak must first unravel the curse and destroy Evil. In this land where magical forces vie for dominance, could true love be the most powerful weapon of all? A beautifully illustrated tale for women of all ages, Ten Fingers Touching explores the complex nature of love and fate. It is an enchanting journey of romance, mystery and adventure. 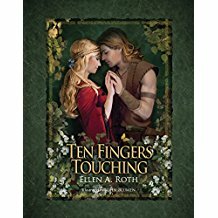 Ellen A. Roth's debut novella is an imaginative take on a classic genre and a treat for the romantic soul.